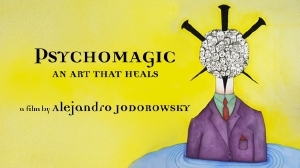 Alejandro Jodorowsky has turned to crowdfunding to finance his next film called Psychomagic: An Art that Heals. The film is based on Jodorowsky's books on the subject, "Psychomagic, The Spiritual Journey", "Sacred Trickery or Manual of Psychomagic" which revolve around the topic of healing through the psychomagic acts, which, according to Jodorowsky, emulates of the language of dreams in order to communicate with unconsciousness. As new-agey as this all sounds, Jodorowsky is great artist and thinker and, not to mention he's directed some of the most mind-altering films ever (read: El Topo, Holy Mountain) I would travel almost any road with him to see where it leads. Psychomagic: An Art That Heals will focuse on the results of his work. Psychologists and psychiatrists as well as artists and filmmakers have also been inspired by this therapy for their work. You can support the film here. Hot glass of bolivian coca leaf tea. Bowl of cannabis. NEW Jodorowsky film. Now if only the sun would come out & warm the weather then also a twenty four pack of beer would materialize. Im drunk at the moment but seriously yall should check out Jodorowskys stuff, really good. good stuff. thumbs up high 5. It's good stuff, drunk or sober!